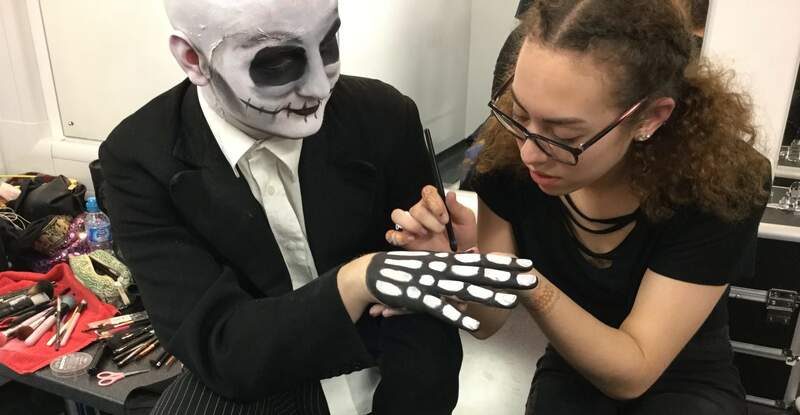 Barnsley College Performing Arts Student Jordan Tapp with Make-up Artistry Student Alex Robinson, preparing for the directed scenes shows. Barnsley College Performing Arts students have directed, choreographed and performed in this year’s Directed Scenes Project. The Directed Scenes Project is wholly student-led. The Level 3 second year Performing Arts students study direction and choreography within their course and are given the opportunity to choose their own co-directors, from their peers, to work with on scenes they have personally chosen to direct. They form separate theatre companies for each project, audition and select their cast from year one performers and then work collaboratively with the first year students for a six week period, working towards a final deadline of a public performance. This year the four projects were: ‘Yerma’ an adaptation based on the Federico Garcia Lorca play, Tim Burton’s ‘The Nightmare Before Christmas’, ‘Peter Pan Goes Wrong’ and ‘Chicago’. The Performing Arts students were very fortunate to have the support of four Make-up Artistry students under the direction of their tutor Millee Barton, who created stunning make-up designs and set up a temporary make-up studio in the theatre dressing rooms to help the students apply their designs at each performance. Donna added: “The Directed Scenes project gives the students valuable professional work experience, learning to work collaboratively and effectively to a deadline, for a public performance in the Electric Theatre. First and second year students will once again join forces to form two production companies to perform Shakespeare’s ‘A Midsummer Night’s Dream’, and a musical by Lynn Ahrens and Stephen Flaherty’s, ‘Once on This Island’, in May 2018.